Jökulsárgljúfur or Glacial River Canyon is a 25-kilometer canyon in the northeastern part of Iceland. The canyon is two and a half kilometer wide and in many places, the height of the cliff on both sides is about one hundred meters. The canyon is a product of the river Jökulsá á Fjöllum ( The Glacial River in the Mountains), a powerful river that has its source in the unstable part of Vatnajökull, Bárðarbunga. Throughout thousands of years, the river has shaped its path with water and devastating floods from the melting glacier in times of eruption. 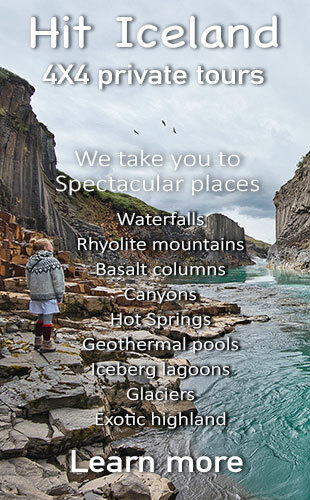 Jökulsárgljúfur is truly a natural wonder and carries with it a load of interesting places like powerful waterfalls, fantastic basalt columns formations, cliffs, pillars, unusual rocks, beautiful spring-fed rivers and a spectrum of vegetation. With all its many beautiful hiking trails and spectacular sites, it is a place where you can stay for days, and you never stop being amazed. Is the Jökulsárgljúfur canyon still on the drawing board? Although most of us see the natural wonders and all the beautiful products of Mother Nature as her grown up children, this is not true about many places in Iceland. Iceland is still a geologically young child and erupts here and there unexpectedly. Just in 2015 a large eruption occurred south of Bárðarbunga, the glacier that feeds the river Jökulsá á Fjöllum. If the eruption had occurred under the glacier, which was expected while geologists mentored the origin of the earthquakes leading to the eruption, the outcome would have been catastrophic for the Jökulsárgljúfur canyon. A flood from a melting glacier would possibly have changed forever all the natural wonders that we love to visit. And we must remember that one such flood occurred only about two hundred years ago. It is also a matter of interest that although we are looking at one of the largest canyons in Iceland, an even larger one lies buried under lava in the South Region. The canyon Skaftárgljúfur was once the largest canyon in Iceland approximately 30 kilometers long and 200 meters deep. In the devastating eruption in Lakagígar in 1783 and the massive lava flow that came with it, the canyon disappeared forever as the canyon was filled with glowing lava. And this was only about 230 years ago, which is only a heartbeat in geological times. There are many ways to see and experience the canyon Jökulsárgljúfur. You can see a large part of it when you visit Dettifoss the magnificent waterfall. You can also visit Vesturdalur, which has a campsite, and there you will get a good view of Hljóðaklettar on a short and easy hiking trail from Vesturdalur. One of the best overviews is from the parking spot by Hafragilsfoss. Here is where you truly see the scale of the canyon. To experience the beauty of this delightful natural wonder a three to four-hour hike from Dettifoss through Hólmatungur all the way to Vesturdalur is recommended. For a place to stay, we can highly recommend the camping site at Ásbyrgi, which is one of the best in Iceland.